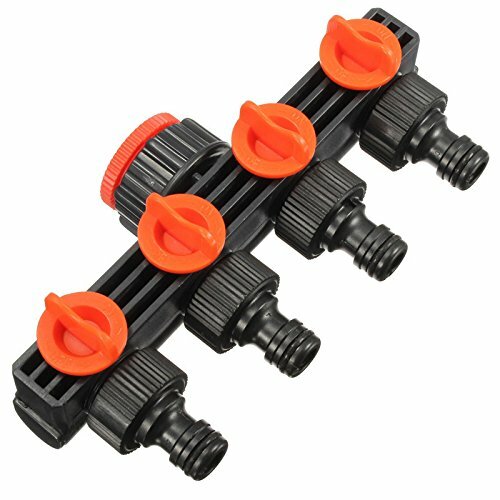 Garden Hose Pipe Splitter Plastic Drip Irrigation Water Connector Agricultural 4 Way Tap Connectors by YingYing Garden and Outdoor at The Net Stores Network. Hurry! Limited time offer. Offer valid only while supplies last. Outdoor and Gardens Size: 18.5 cm. Converts a single tap into 4 outlets. Includes shut-off valve to each outlet. 3/4 inch BSP threaded inlet to fit most garden taps. 4 x 1/2 inch quick connect male outlets. If you have any questions about this product by YingYing Garden and Outdoor, contact us by completing and submitting the form below. If you are looking for a specif part number, please include it with your message. Josy&co. 2 Way, Y Valve Water Hose Splitter - Solid Construction With Comfortable Rubberized Grip.